Packed with hazelnuts, dark chocolate chunks and dried cranberries, these biscotti are a hearty biscuit perfect with a cup of coffee or tea. These make a great Christmas present packaged in a tin or simply wrapped in some parchment paper and twine. Preheat the oven to 350°F. Line 2 baking sheets with parchment paper. In a large bowl, whisk together the flour, sugar, cocoa, baking soda and salt so there are no lumps. In a separate bowl, whisk together the eggs and vanilla. Add the egg mixture to the flour mixture and stir until thoroughly combined. The mixture will seem dry but keep on stirring and you will end up with a dark glossy batter. Fold in the chocolate chunks, hazelnuts and cranberries to evenly distribute. Pour half of the mixture onto one of the lined baking sheets and shape into a long log shape (about 8 x 5 inches). Repeat with the remaining batter on the second baking sheet. Bake for 25 minutes. Remove from the oven and allow the logs to cool for a few minutes. Once slightly cooled, carefully transfer the logs to a cutting board. Using a serrated knife, cut the logs on a diagonal into ¾-inch slices. Return the slices, cut side up, to the baking sheets and bake in the oven for 10 minutes. Remove from the oven and allow to cool on the baking sheets. 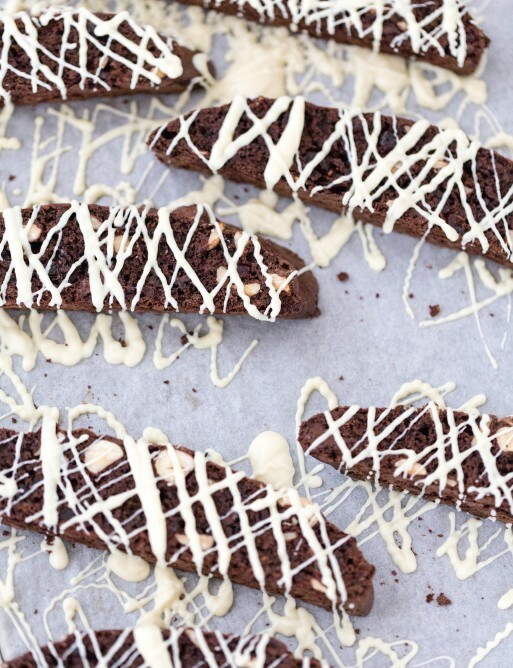 Once completely cool, drizzle the biscotti with melted white chocolate to garnish (if desired). Once chocolate is hardened, store the biscotti in an airtight container.